I continued working on getting a snug fit for the rear window. I got out of sync with the manual construction steps and installed some brackets on the roll over bar that now interfered with the forward lower corners of the window. 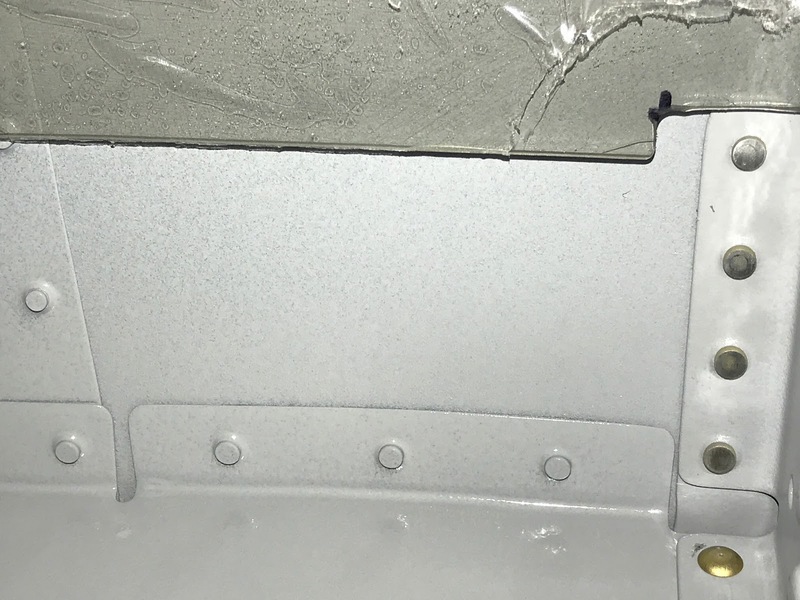 I marked and notched the corners to allow the window to fit over the clips. Today warmed up nicely with no wind. Perfect for painting. 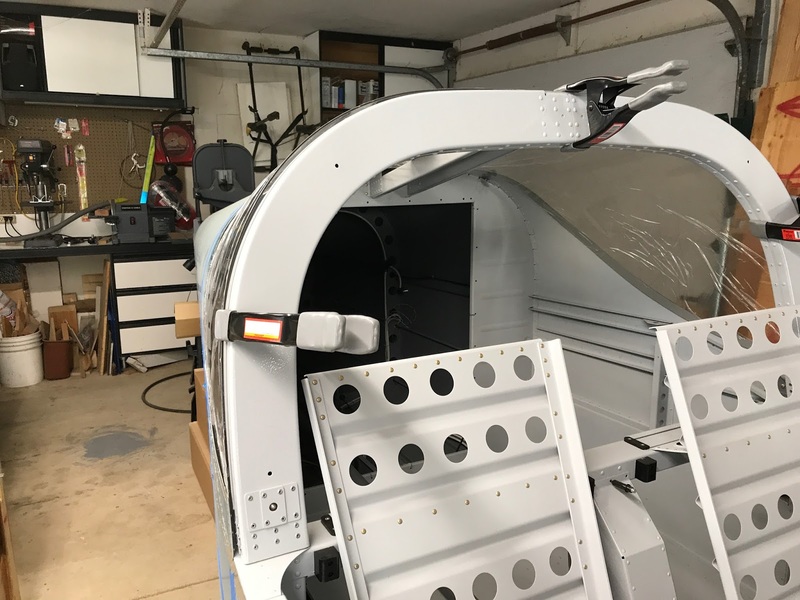 I set up the saw horses on the driveway and shot the Stewart Systems Dawn Patrol Gray EcoCrylic paint on the inside of the canopy frame. 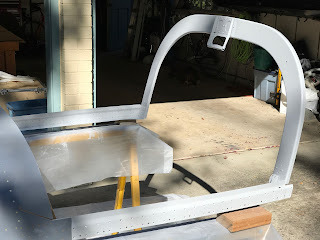 I worked on getting the canopy frame assembled as far as possible and prepped it for painting. 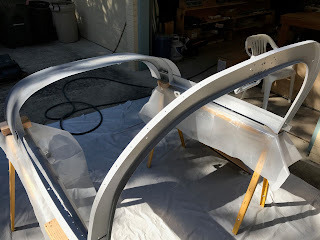 Tomorrow is supposed to be warm so it will be a good time to get the paint on. 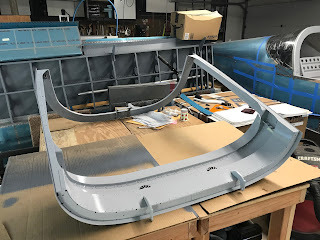 Another RV-14 builder in my area visited my project a couple times and is making great progress on his project. He inspired me to get out to the garage. 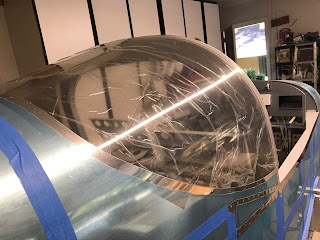 While the weather is still warm I decided I should tackle the plexiglass and get some painting done. I centered up the rear window, clamped it in place and marked the cut out notch at the back where it fits around the top brace. 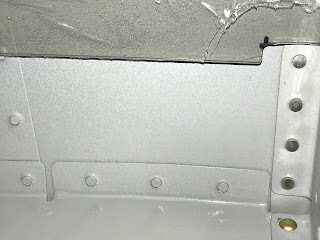 I used the dremel to make and smooth the cut. 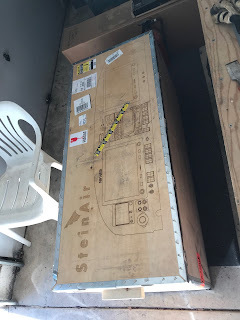 The box from Steinair arrived today. And here is where I ended up by Rev. 5 on April 14th. I spent a lot of time trying to imagine flying behind each iteration including worrying about various failure scenarios. It is easy to get over whelmed and I won't really know if this is the right layout until I'm actually flying behind it. However, it was really great to work with the experienced designers at SteinAir who were able to steer me in the proper direction. 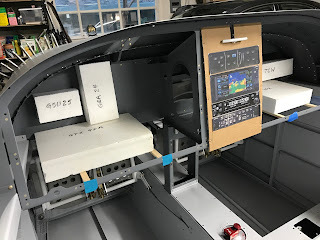 At the start of my avionics planning I purchased and read through (multiple times...) AeroElectric Connection by Bob Nuckolls. This book is the bible for designing electrical systems for experimental aviation. 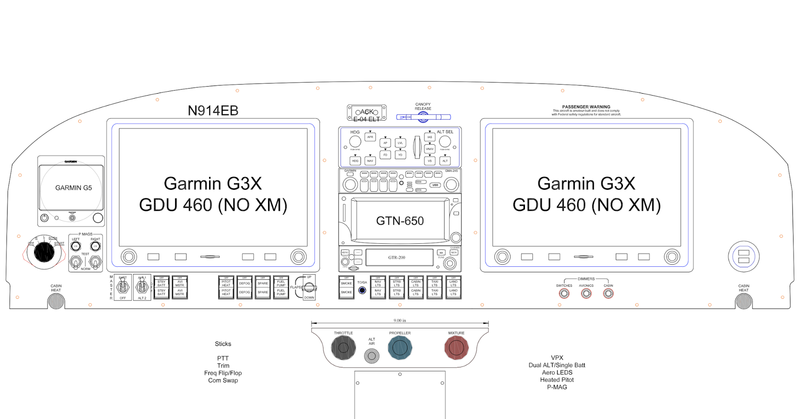 I knew I wanted to have an all electric panel (no vacuum instruments) and I do fly on instruments occasionally. To do so safely you must have a robust electrical system. After looking at the various systems illustrated in the Nuckolls book, I was inclined to go with a main battery and 2 alternators approach. The dual battery systems introduced a level of complexity (and weight) that I don't think I will need. 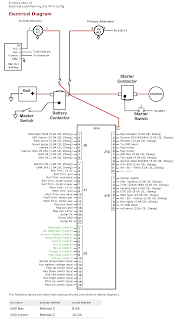 I was intrigued by the Vertical Power products because they implement many of the features of the circuits illustrated in the Nuckolls book but with microprocessor controlled solid state busses. I spent quite a bit of time trying out different configurations of equipment using the VP-X planner software. 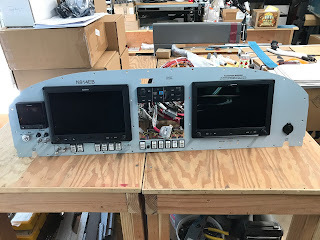 I quickly discovered that for an IFR panel there are not enough circuits in the VP-X Sport so I moved on to the VP-X Pro. To use the planner software you first have to make an entry for each piece of equipment and specify the current draw. Then you can assign the equipment to the A or B bank, keeping in mind how the panel would operate if either bank fails. You can also assign equipment to panel switches. 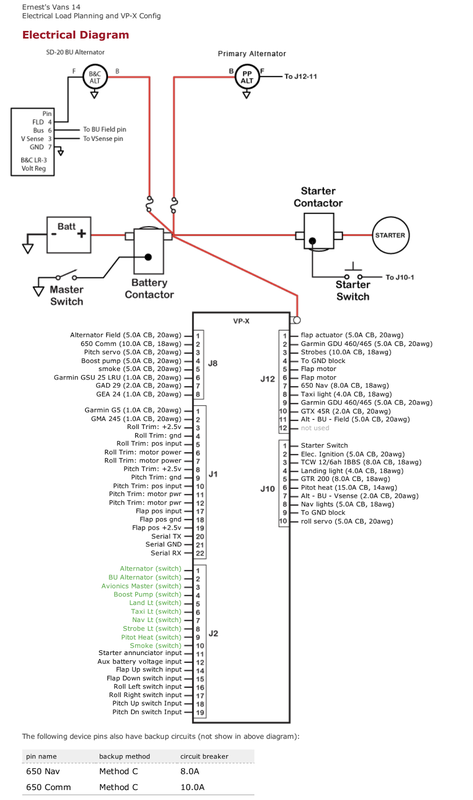 The planner then spits out a wiring diagram. Doing the layout exercise helped me refine my equipment list and prepared me for discussions with SteinAir. 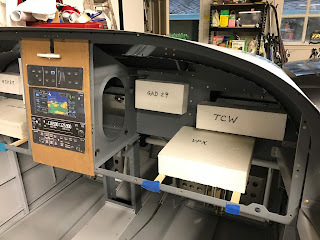 I read through the tutorials on the Vertical Power site and read Aircraft Wiring Guide by Marc Ausman to get a better handle on how to configure the electrical system. Here is the initial layout that I arrived at before starting discussions with SteinAir. 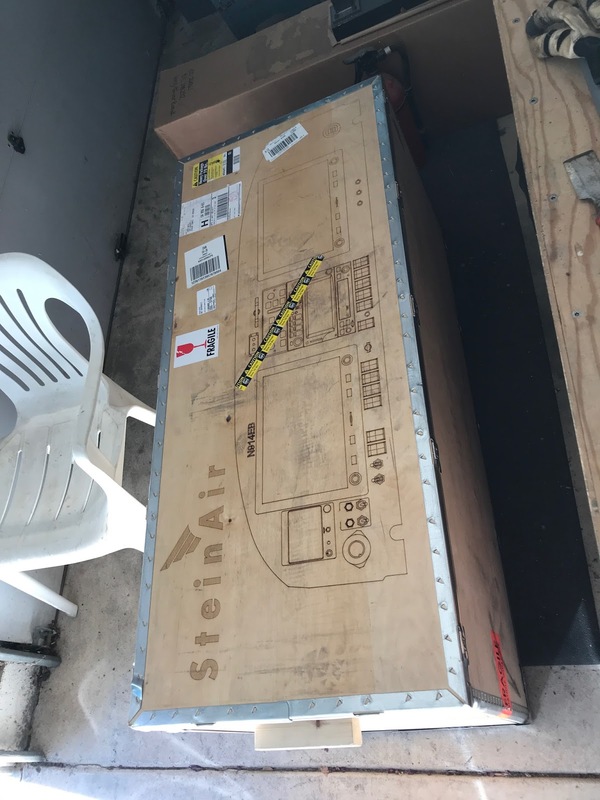 It took about a week of back and forth discussions with SteinAir to settle on an equipment list and to get the initial purchase order. Started work on panel planning. I decided to go with a dual Garmin G3X 10" touch display system with a G5 backup display. A Vertical Power VPX Pro will control the circuits and dual alternator based electrical system. A TCW backup battery will provide electrical redundancy for a G3X display and critical circuits. The G5 display has a separate backup battery also. 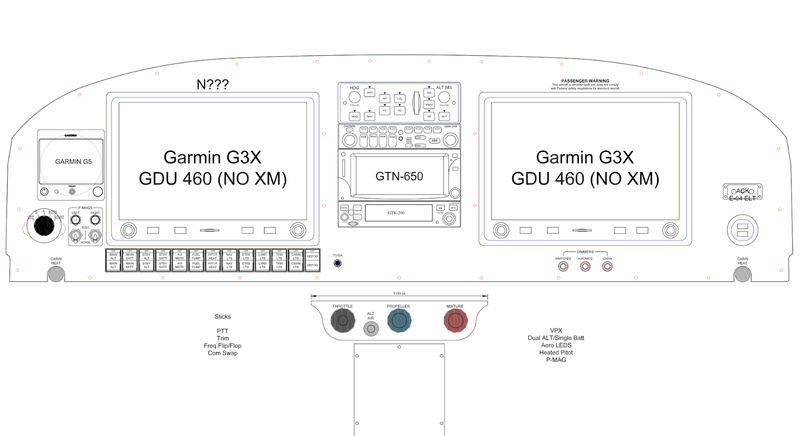 The center radio stack will include a GTN-650 nav/com/gps, GMC307 auto pilot controller, GTR-200 com and GMA-245 audio panel. The arrangement I came up with will require cutting the sub panel through hole a little deeper to accommodate the GTR-200, but I don't think it will be a major deal breaker. 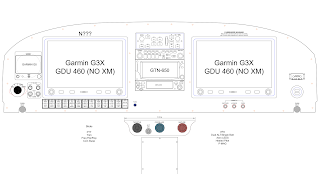 Although the G3X can display and manage the 2nd com, I decided to put the 2nd com radio in the center stack to have an extra set of buttons and display. 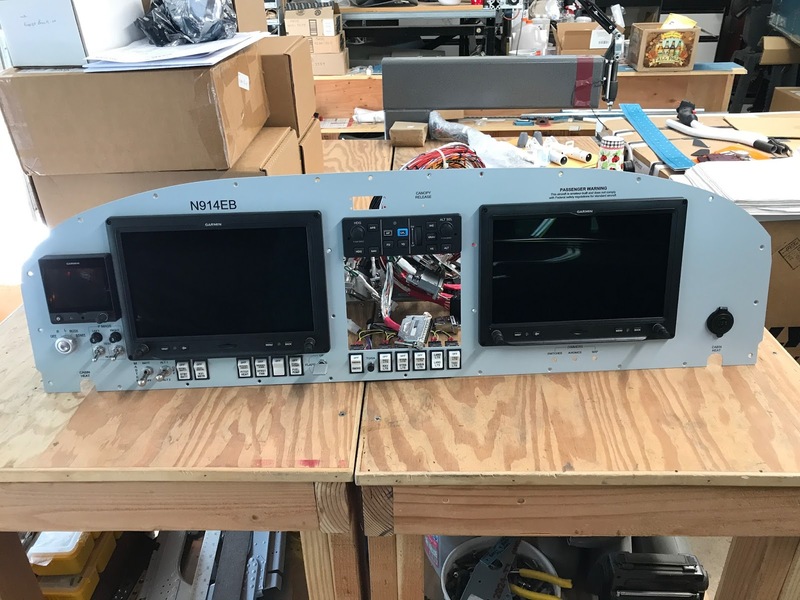 My thinking is that it affords some redundancy and I've found that when flying formation, the radio ops are always a challenge and having a dedicated radio panel in the center might help out with situational awareness. That's my theory anyway, it may be different when I get to fly with it. 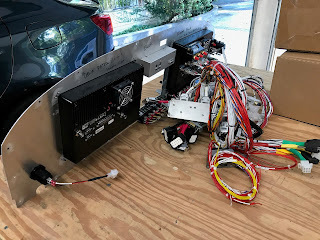 Also, after looking at all the other boxes that need to be fit behind the panel I figure the center stack is an efficient use of space for the radio. There are a lot of support boxes that must be located behind the panel including the GEA24 engine monitor, GSU-25 air data, GAD-29 ARINC interface, GTX-45R transponder / ADS-B, TCW backup battery and the VPX circuit controller. I cut out foam blocks to match the dimensions of all these boxes (including space for the large connectors) and fit them in the space between the front and sub panels. 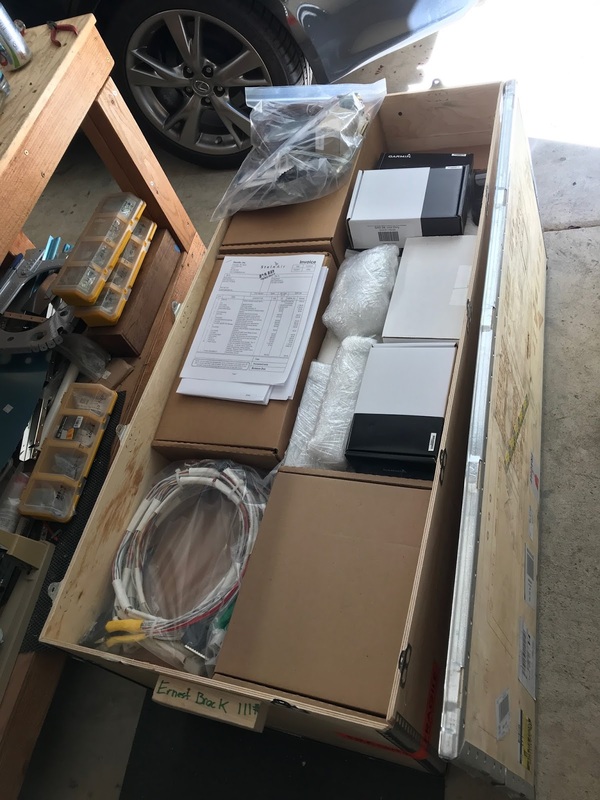 I plan to use swing down hinged shelving to support the GTX-45R and VPX boxes to make access easier.